The 2016 leap second is over. The GPS did report the correct time, but the Heather program unfortunately not. It reported 01:00:60 instead of 00:59:60. At least we did saw the '60' second. This year i'm streaming the 2016 (UTC) leap second using a view only, single application, VNC service. You can find the Lady Heather's GPS Disciplined Oscillator Control Program documentation here. 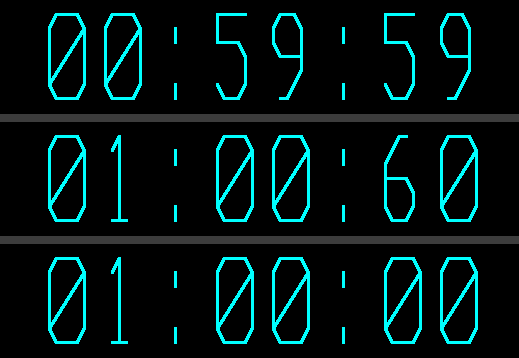 In The Netherlands, the leap second will take place on 00:59:60 local time, as a result of the UTC+1 timezone. So for us it will already be 2017. Happy new year! LH screenshot, leap second pending. About the north pole hole; GPS satellites orbit from 60° North to 60° South. Although the GPS signal covers the entire earth, satellite density is greater when facing the Equator than the Poles. The VNC server address and port will be provided on request only. PC Engines APU, PDF Manual. Trimble Thunderbolt GPS receiver, PDF Manual. Active patch antenna on the roof. Start Arch Linux install over PXE. #No getty on serial, because we are using the serial port for the GPS receiver. Remove the serial terminal settings in Grub and kernel cmdline. The GPS receiver is connected to the only (from the outside) available serial port. Add heather user to uucp group. #  one with a '/', '-', '@', or '$' otherwise the line will be treated as a comment. #  Lines that begin with '/' or '-' set command line option values. #  Lines that begin with '$' send hex values to the receiver. # and macOS, use a number 1 greater than the operating system device id (e.g. # 115200:8:N:1, 57600:8:N:1 and, 19200:7:E:1 in that order. The creation of the screen dump takes a lot of resources and will hang Heather for a couple of seconds. The next steps let you take screenshots outside of Heather. Recompile heather with setting leap-dump = 0; in the file heather.cpp. Run this script from cron or systemd.timer as user heather.